We make that eight, a third of the fleet, stored. There have been reports on the internet of ten stored but we cannot account for two more. 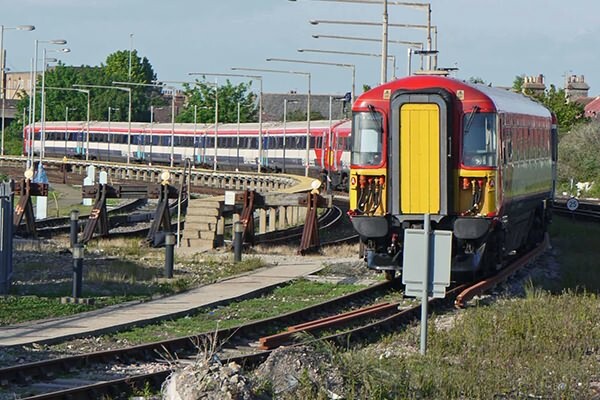 Class 442 units are expected to remain in service, albeit in a diminishing role, for some months yet as the cascade hinging on introduction of Class 700 units is well behind schedule. We understand the 442s to be kept mid-term by Southern for Eastbourne - London Bridge peak workings will be 442402, 442406, 442408, 442410, 442413 (the SEG's favourite unit) and 442419. (above) 442415 and 442418 stored at Eastbourne on 24th May 2016.